Since the end of the eighteenth century, bowmakers have been recognised as distinct from violinmakers. In 1785, the famous “Encyclopédie” compiled by “Diderot and d’Alembert”, reveals that “there are in Paris artisans who make bridges, others who make bows, and similar minor accessories”. The phrase “others who make bows” shows clearly that bow making was already a recognized skill, even though it applied to these so-called “minor accessories”. Drafted in 1599 and approved by the French King “Henri IV”, the statutes of the Parisian Music Instruments Making Guild made it clear that the decoration of instruments and the production of their accessories were jobs reserved for the official workshops. Competition was considered bad for business and many Parisians trades were organized in guilds to protect their activity. However, the numerous legal procedures show the insoluble difficulties experienced by the different trades in attempting to distinguish themselves through the application of strict rules. It was also considered important to ensure knowledge was passed on to future generations, and to ensure the quality of workmanship through closely controlled apprenticeships and Diplomas called “Brevets”. The first Diploma was that of “Compagnon” (a highly qualified worker), after a strict six-year apprenticeship with one of the guilds which was obligatory in Paris. The more advanced “Maître” (Master) was reserved for the best (and richest) “Compagnons” and in particular, for the sons of Masters. Without these Diplomas it was not possible to work officially in Paris: the Masters could only employ qualified Compagnons, and the Compagnons could not open their own shop in Paris without the expensive Master’s Diploma. Furthermore, to become a member of a Guild, candidates had to be of the same religion as the King – Catholic – and to be one of his subjects – that is, French. Those who were unqualified, poor, Protestant or foreign, or even in some cases Frenchmen having worked their apprenticeship outside Paris, were therefore obliged to work in one of the “lieux privilégiés” (Privileged areas). Among the owners of these places, called “enclos” (enclosures), were certain rich noblemen of high standing who benefited from ancestral privileges granted by successive French Kings. But there were above all a lot of ecclesiastical properties and monasteries with charitable and health care traditions. These areas were sometimes in the suburbs of Paris, in the “Faubourgs” like that of “Saint-Antoine” – near the “Bastille” – highly populated around its Abbey. Most of them – about forty – were situated within the city. Like the famous “Quinze-Vingts” (15-20) Hospice founded in 1254 by King Saint-Louis (Louis IX) to accommodate three hundred (15 times 20) knights who had returned blind from the Crusades. As well as welcoming all kinds of artisans and small businesses, it was located in the city centre just next to the “Louvre”, to the great displeasure of the guilds for, as in all the areas of Privilege, the workers simply paid their rent and nothing else was asked of them. So, hoping to convince the public of the supposedly inferior quality of the workmanship of the “free artisans”, the guilds had persuaded the Royal authorities to require them to mark their work with the name of the area where they worked, and, more significantly, to forbid the sale of these works outside that place. Poverty, lack of space, sometimes difficulty of access and the bad reputation of certain places would supposedly discourage potential customers. In addition, the guilds often tried to control or to confiscate the privileged goods. 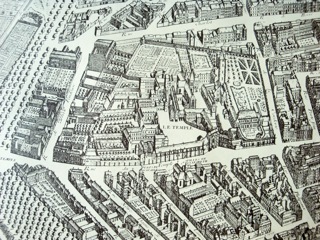 Sometimes without success: in 1722, for example, in the area of the “Saint-Martin-des-Champs” Abbey (nowadays, the national “Conservatoire des Arts et Métiers”), the official representatives of the instrument makers Guild, in spite of the fact that they were supported by the police, were obliged to withdraw when faced with workers bitterly defending their Privileges. However, behind this apparent hostility, there were some channels available for communication between these two very different working worlds, making it possible for privileged workers to join the guilds. 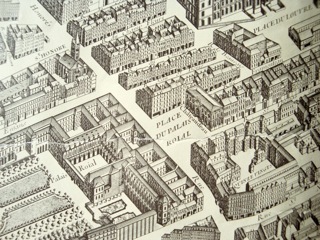 In 1740, a maker called “Pierre Ruelle” was accepted as a Master. He had started as a cabinet-maker in the “Faubourg St-Antoine”, and then set up as a harpsichord maker in the “Saint-Denis-de-la-Chartre” area, near Notre-Dame cathedral. Similarly for the famous harp maker “Jean-Henri Nadermann”. Having arrived in the Faubourg Saint-Antoine from his native Germanic and Catholic Westphalia around 1760, he started out as a simple joiner before becoming Master in 1766, thanks to a Royal decree and to Queen “Marie-Antoinette” who was originally Austrian and a pretty good harpist. His Diploma only cost him a third of the usual price. In the end, however, he was supported by the Guild that needed money to pay off a financial deficit! But the Instrument Makers’ Jury could also oppose the acceptance of a privileged artisan, often for personal reasons and sometimes due to jealousy. This was unfortunate experience of “Gilles Lot”, a maker of wind instruments whose diploma as Master was refused even though he fulfilled the required conditions: he had married the daughter of a Master (a situation which counted in his favour according to the statutes) and he had worked successfully for many years in the “Saint-Germain-des-Prés” area (now the eponymous square). Nevertheless, he was rejected because his apprenticeship, although official, had lasted five years instead of six… exactly the same period as that of the Jury members! Transfers from guilds to privileged areas were also sometimes seen. For various reasons, whether due to tax, lower wages to pay, or to escape creditors, certain Masters set up in privileged areas. But in such cases, they had to agree to be evaluated by their peers despite the risk of losing their Diploma. That was the decision taken by the harpsichord maker “Anton Vater” (of Germanic origin), who left the centre of Paris and his very small lodgings for the “Temple” area, formerly the domain of the order of The Knights of the Temple (the Templars) disbanded at the end of the Middle Ages. Allotted in modern times to the order of the “Hospitaliers de Saint-Jean-de-Jérusalem”, it was the most extensive (now destroyed and only the name remains) of all the privileged areas, with four thousand residents in its six hectares. 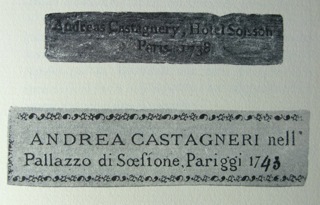 A particular case was that of the violinmaker “Andrea Castagneri”. Coming originally from Turin and set up since 1720 right in the centre of Paris in the “Hotel de Soissons” at the property of the “Prince de Carignan”, he was obliged to apply for, and to obtain his Master’s diploma when the Prince left suddenly in 1740. 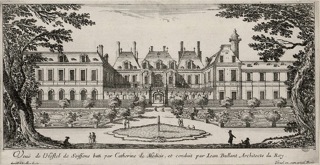 The Prince, crippled with enormous gambling debts had had his property confiscated, including the Hotel de Soissons, a privileged area that would later be destroyed in 1747 (nowadays the “Bourse de Commerce” close to the Halles public garden). There were other channels of communication between these different working worlds, but they were ambiguous regarding the rules of the Instrument makers’ Guild. Referring to Section 10 of the corporative Statutes, which only allowed group purchases of various merchandise from “foreign merchants or others of this kingdom”. Certain individuals circumvented this rule and subcontracted, most probably at little cost, a part of their personal business to privileged areas. In 1755, the organ builder “Robert Richard”, a respected Master, was “astonished” to find a bailiff come to seize the goods that he had had made by a widow of joiner working in the Faubourg Saint-Antoine. His astonishment, duly recorded in the police report, goes to show the commonplace nature of this practice. No doubt that his professional success (he had built the organ in Montreal Cathedral, Canada) must have provoked some jealousy among certain of his colleagues of the Guild who had decided to denounce him… as indeed they were required to do by Section 14 of the statutes! As for bows, some of them were clearly subcontracted to the privileged areas, especially those with a screw mechanism, fluted, and in exotic wood that was difficult to work with. It must have seemed simpler to have them cheaply made by the joiners and cabinet-makers with the appropriate tools on the Faubourg Saint-Antoine where all the woods were stocked. 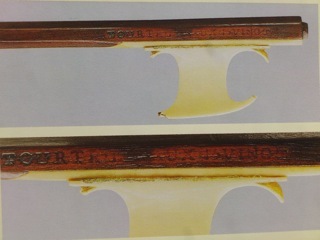 How else could we explain the presence of two hundred and fourteen bows with the screw mechanism, one hundred and eighteen of which fluted, among the two hundred and ninety nine bows in the shop of “Louis Guersan”, the famous violinmaker, when an inventory was taken on his wife’s death in 1758? Especially as no exotic wood was found. So, according to what is said in 1766 in the (French) Dictionary of Trades and Crafts – “all this work (the bows) concern the workers and apprentices of the craftsman; (but) there are (…) some people in Paris who only work on these accessories” – it seems consequently impossible for such a quantity of bows of all kinds to have been all made just by the five or six Guersan’s “workers and apprentices” fully occupied making instruments and doing repair work for the numerous clients of that Master, “luthier” to the Court of King Louis XV. In 1776, King “Louis XVI” and his Minister of Finance, Robert Turgot decided to abolish the guilds, who were naturally furious, as were the proprietors of the privileged areas who feared having to lower rent they charged the “free workers”. Faced with this general outcry, the King abandoned the project and Turgot was dismissed. But the guilds were forced to reorganize. A majority merged so as to put an end to their countless legal battles. Foreigners and Protestants were at last allowed to join, even if they had served their apprenticeship outside Paris. The price of membership was reduced to a quarter of that it had been previously for the instrument makers and some privileged artisans were therefore awarded the Masters diploma without difficulty. Among them there were many foreign instrument makers as well as some luthiers from the French Duchy of Lorraine having not followed a Parisian apprenticeship. 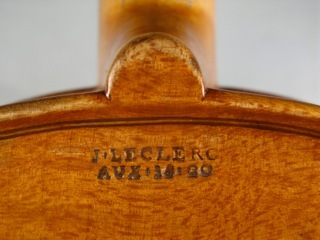 A particularly interesting case is that of “Toussaint Nicolas Germain Lefebvre”, known especially to us as a bow-maker but who was also a violinmaker. Some of his bows are marked “Cimetière St Jean” (St John’s cemetery). 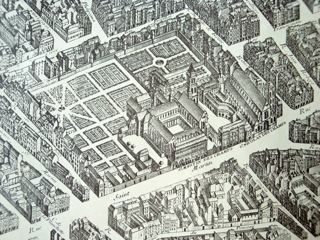 That was a square, a former cemetery, behind the town hall and close to the “Saint-Gervais“ church – still existing. As these bows were branded in this way the place must have been “privileged”. However, it doesn’t appear on the list of privileged areas established in 1716 by the Royal administration. In fact, the place of the cemetery was part of the former domain of The Knights of the Temple before they moved towards the north of Paris during the Middle Ages. There they kept some houses which remained “privileged”. 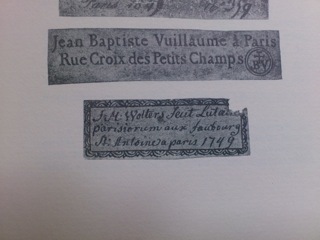 In 1778, Lefebvre became a Master, which freed him from the obligation of marking the name of the area on his production (and, why not, to subcontract bows to others makers). 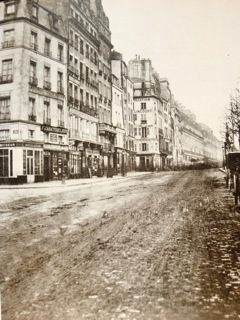 After 1800 and the abolition of the religious orders and privileges, he worked at Number 20, “rue Saint-Antoine”. However it’s not clear whether this implied a real move, as the very first numbering of all the Parisian houses had recently been carried out by the Napoleonic administration. “Nicolas Pierre”, the father, lived and worked very modestly in the slummy Faubourg Saint-Antoine. At first simultaneously joiner, cabinet-maker and instrument maker, he therefore did all kinds of work to commission, including bows that were fluted and extremely well made. We also know of two signed violins. Unfortunately, one of these is an obvious fake, and the other, with a beautifully decorated head, cannot be safely attributed to him. However, we have recently found an authentic hurdy-gurdy made in 1730, the original label of which is very difficult to see without opening the instrument. As there is no name of a privileged area (see the Wolters label), this may have been a subcontracted job for a Parisian Master”. On the death of Nicolas Pierre in 1764, “Léonard”, his elder son was 18. At that age, in those days, an artisan could already be assumed to be competent in his work. According to tradition Léonard would be expected to carry on in his father’s craft, and would thus have done work for various Parisian makers. However, we know of no instrument by him. No doubt he was ambitious and he understood early on the importance of the “minor accessory” as the bow was then considered. 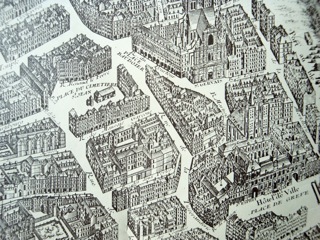 He set up inside Paris, next to the wealthy “Marais” district, most probably in the “Saint-Paul-des-Champs” privileged area, as he was married in its Church (now destroyed) in 1767. He then worked in the Quinze-Vingts, where his bows inspired by the model used by the famous German violinist Wilhelm Cramer established his reputation. But the Quinze-Vingts gradually closed. Léonard then left for the “Faubourg du Roule”, also privileged, where he would remarry in the Saint-Philippe church (still existing) in 1788. He had professional contacts there, especially with the rich noblemen from the neighbouring “Faubourg Saint-Honoré” who were amateur instrumentalists, aristocratic patrons and organizers of private concerts in their luxurious residences. These artistic and commercial relations became problematic for him later on, both during and after the Revolution: at first political, then to do with his health, from 1793 to his death in 1807. 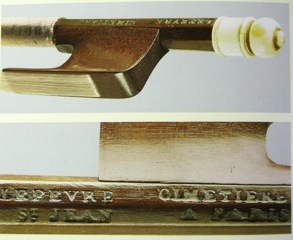 Leonard’s bows with the mark “Quinze-vingts” were obviously made and sold by him personally within the privileged area. Those branded simply “Tourte. L” were made later, having established his reputation on the Faubourg du Roule after 1776-77. There, during this time, the rules were less strict and did not oblige him to mention his place of work. The remaining bows, unsigned, were those that he had made throughout his career, for instrument merchants and violinmakers. 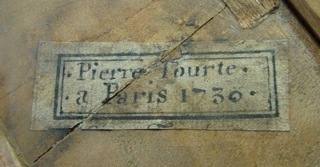 His younger brother “François Xavier”, called “Tourte le jeune”, was born in 1748 (not in 1747 as previously thought). In 1856, the famous French musicologist “Joseph Fétis” tells us in a book that this younger brother first worked as a clock maker. In this case, he could only have worked his apprenticeship in his native privileged Faubourg Saint-Antoine, most probably with a member of his own family. Fétis also tells us that François worked eight years in that trade but was unable to make enough money for his needs. So, there can be no doubt that early on he assisted Léonard – maybe at first in making screw mechanisms. 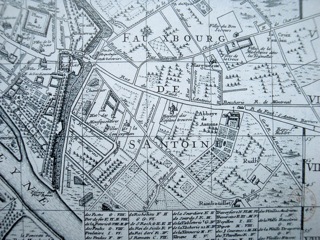 In 1776, François Tourte took advantage of the reorganization of the guilds, and of the more liberal working conditions that resulted, to move from the Faubourg Saint-Antoine to the “rue du Chantre” (now destroyed) in the centre of Paris, a stone’s throw from the Quinze-Vingts where his brother was probably still working and with whom he was collaborating more and more closely. It was in this “rue du Chantre” that his son “Louis François” would be born in 1786. We may therefore wonder if, in addition to his collaboration with Léonard, he may possibly have continued to work in clock making. Indeed this was a time of great popularity for musical objects and instruments (winds, harps, piano and so on) with more and more complex mechanisms, sometimes inventions that have since disappeared. 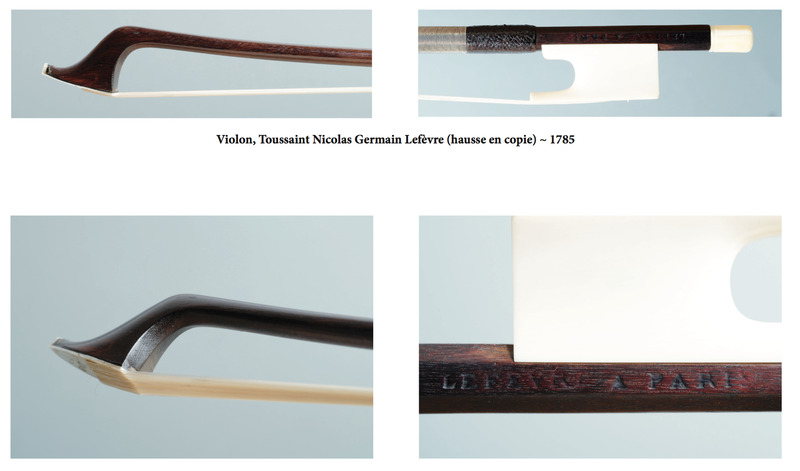 Considering the estimated prices for the bows as given in the Inventories, it must have been very difficult for an artisan (excluding, possibly, Léonard himself), to live on bow making alone. Especially as there were many privileged makers of “accessories” attempting to make a living. However, François Xavier could only work in a privileged area. 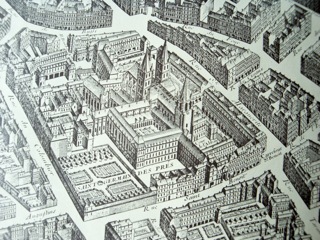 The closest was that of the religious “Cloître Saint-Honoré”, a few steps from his home on the “rue du Chantre”. He was thus an immediate neighbour of many Masters. We must remember that at that time, there was no public transport and no street lighting, and ordinary people didn’t have horses or coaches. They travelled on foot, in all weathers, sometimes with a heavy handcart, through the Parisian streets, which were dark, humid, dirty, dangerous and badly paved. As they worked ten hours a day, six days a week, they therefore lived as close as possible to their place of work. To conclude, one can say that there’s nothing to be surprised at that François Xavier’s bows are not signed. He was a modest man who worked for a long time not just for and with his brother, but also for violinmakers and Music Merchants who didn’t think it necessary to sign bows, a mere “accessory”. Throughout his life, Tourte therefore preserved his habits of not signing his bows. His genius for workmanship was a sufficient signature.